You might have noticed that besides photography I am also really interested in the weather, especially wild, unpredictable, unusual weather. This photo was taken way back in 1998 on a Canon film camera and then scanned. This was one of my first pics to be published. 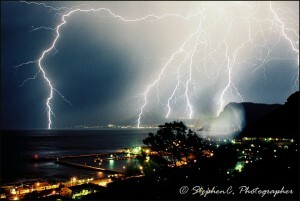 The shot was taken around 1am from Boyes Drive in Kalk Bay in Cape Town overlooking Kalk Bay Harbour and False Bay towards Simonstown. The exposure was around 14 seconds and in that time two bolts of lighting (and a drop of rain) struck and exposed onto the film. The the real reason for this post is to share with you a graph on the current rainfall situation in Cape Town. I have been recording weather via a Davis Weather Station on our roof since 2006 (I don’t claim all recordings are scientifically correct). 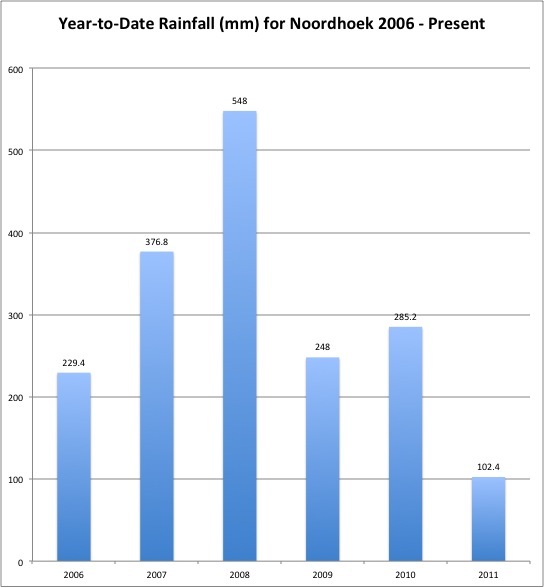 The graph below shows comparative rainfall figures year-to-date for the past 5 years as at end of June for Noordhoek. We are still more than 100mm off the lowest recording in the past 5 years. That was in 2006 when by this stage of the year we had had 229.4 mm. 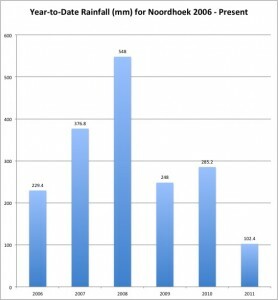 In wet 2008 we had received 548mm by the end of June. Maybe we’ll still get 100mm or more to bring this year more in line. I hope so. I think only today have the waterfalls on Ou Kaapse Weg started running. In the past I recall them gushing around mid May.